Home > Flying Lure Sold! 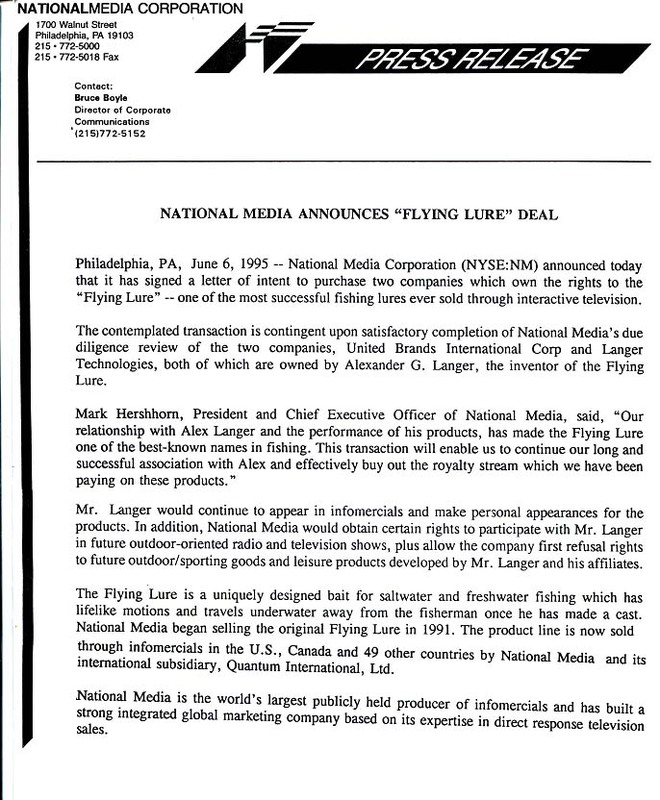 In 1995 Alex Langer began exploring a sale of the Flying Lure brand. The infomercial company, National Media Corp. was the logical buyer. The infomercial company understood and appreciated the product. See the rosy press release from National Media in the picture to the the left of this text. The Flying Lure was Alex’s baby, but he didn’t want to treat it like a real living thing. That would be a mistake in business or in life. He was torn, but made the fateful decision and sold the company in June, 1995. Surely, National Media wouldn’t screw it up! As it turned out, selling the Flying Lure was a big mistake, which would only become clear years later. An oft-repeated story in business played out after the Flying Lure was sold. Big company buys little company, doesn't know what to do with it and ultimately big company kills little company. 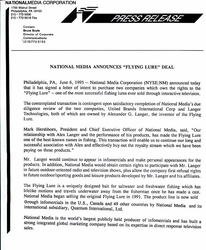 A new team of professional managers arrived at National Media Corp. shortly after the sale of the Flying Lure. They didn't really understand or personally experience the Flying Lure at all. They farmed out the Flying Lure to another company that really didn’t understand it, or even fishing. The Flying Lure went from the toast of the fishing world to “the Flying Who?” Basically, the brand was wrecked and it disappeared. Fortunately, this story has a happy ending. So many people had success with the Flying Lure, that they simply demanded it back. Alex got countless letters, emails and phone calls from anglers around the globe who wouldn't let it die. It was kind of like the well-known story of Steve Jobs and Apple Computer. Steve was kicked out of Apple in his prime, but later re-took control of the company again and pioneered innovative products like the iPhone, that people really wanted. Years later, Alex triumphantly re-acquired the Flying Lure brand again and pioneered the RotoTail. Alex Langer and the Flying Lure family of users and fans are back together again. And now those anglers are introducing their children and grandchildren to the Flying Lure. Now that’s a fairytale ending nobody could have predicted at the time -- especially Alex!